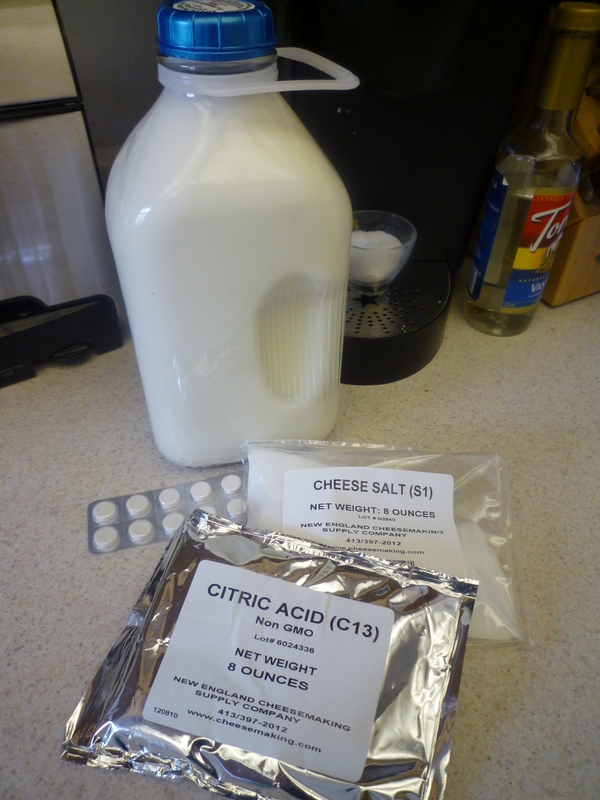 A few weeks ago, I decided to try my hand at cheese making. It’s something I’ve always wanted to give a go, but wanted to do a little bit of research before trying. (With graduate school out of the way, I’m now working through the backlog of cookbooks and recipes I neglected.) For someone who loves cheese as much as I do, the prospect of making my own was very exciting. Since I’d planned to make Joe a special meal for Valentine’s day, I saw it as an opportunity to get something extra-special on our plates. 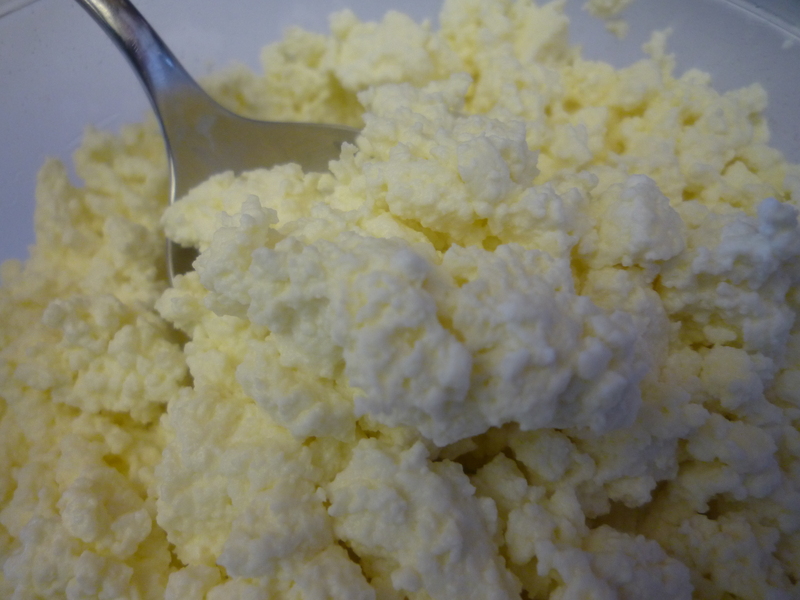 I started with ricotta, the easiest cheese to make. If you have milk (whole and 2% yield the best consistency), buttermilk, and some cheesecloth, you can make ricotta in under a half-hour. Line a colander with a few layers of cheesecloth and set aside. 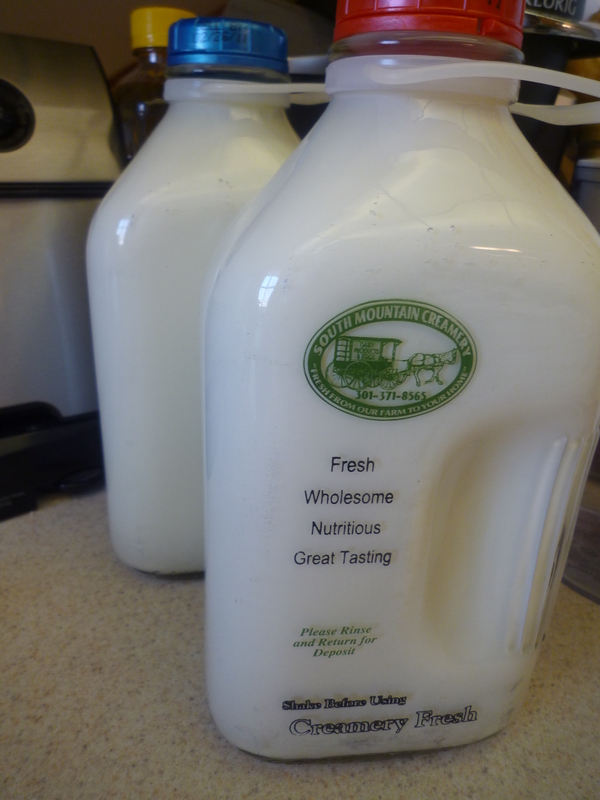 Combine a half-gallon of milk with 2 cups of buttermilk in a large pot over medium high heat. Stir every so often to keep the mixture from scorching, but once it is hot and steaming, stop stirring. 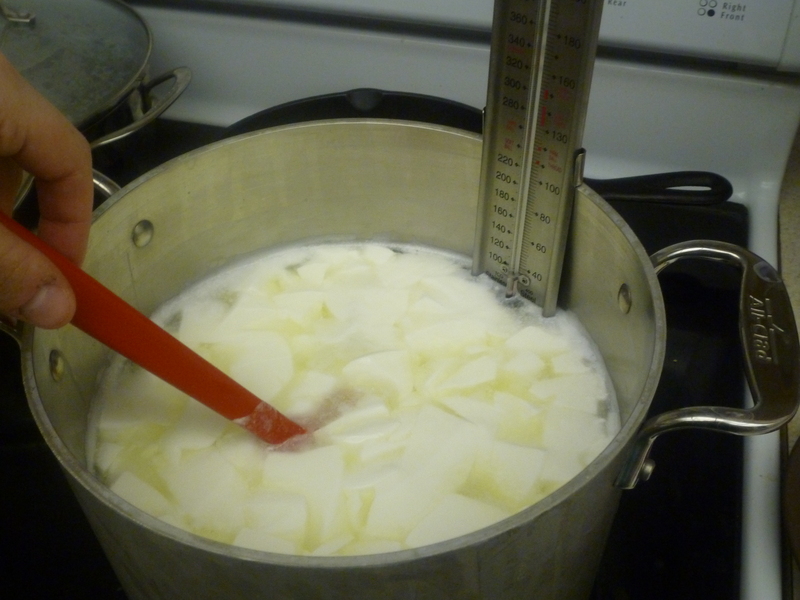 When the mixture reaches about 175 degrees F, the curds will separate from the whey. 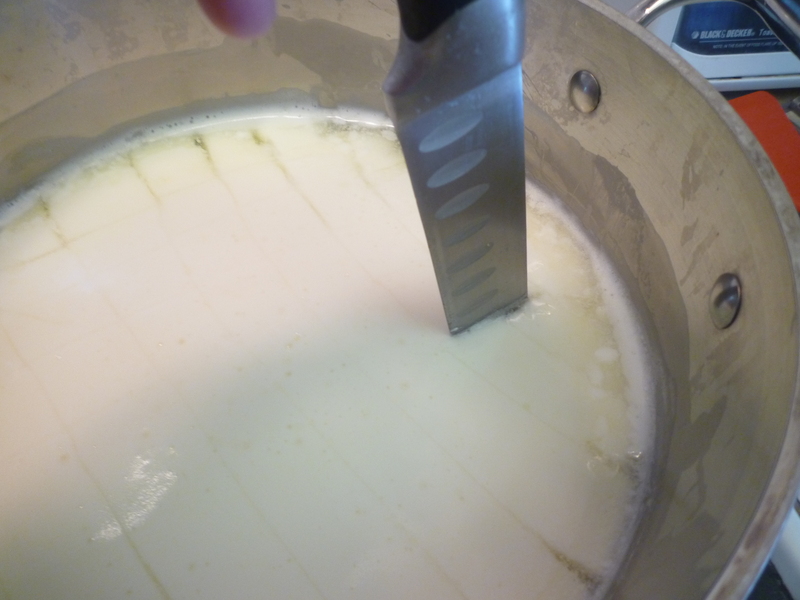 Gently ladle the curds into the cheesecloth, tie up the corners, and hang the cheese to drain for about 20 minutes. Voila! You’ve made ricotta. Store in an airtight container in the refrigerator for up to a week. Next up was another favorite: Mozzarella. This required a bit more special equipment, but I was able to order anything I needed from New England Cheese making Supply Co. I must recommend Ricki Carroll’s book, Home Cheese Making if you’re interested in learning all about the history and science behind cheese. 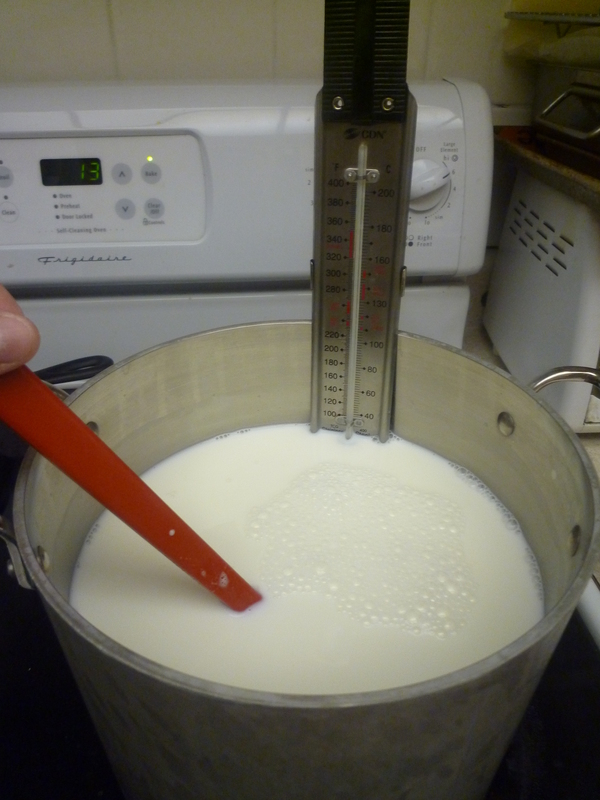 Combine the milk and citric acid/water mixture in a pot over medium-high heat while stirring vigorously, then stir gently while the milk heats to 90 degrees F.
Take the pot off of the heat and add the rennet, mixing in a gentle up and down motion for 30 seconds. Put a lid on the pot and leave it undisturbed for 5 minutes. 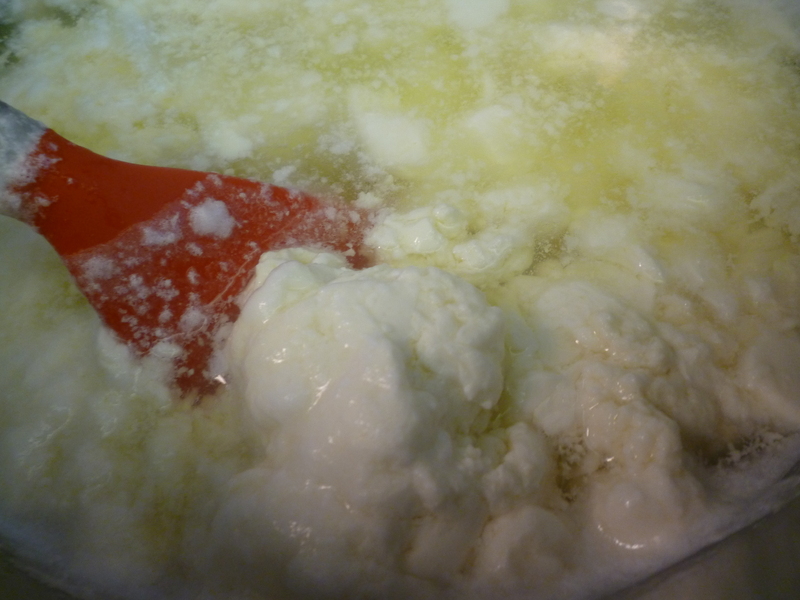 When you remove the lid, the curd should look like custard and should show a clear separation between the curd and whey. 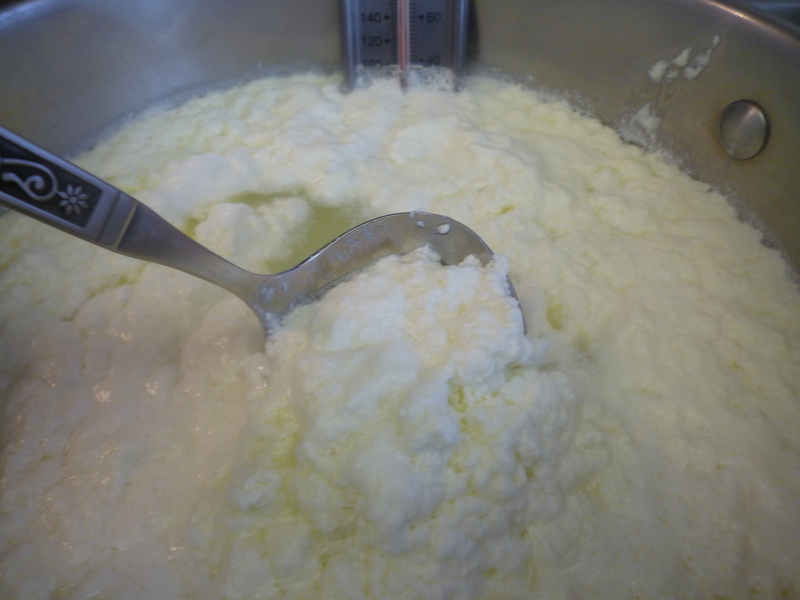 Test by putting two fingers between the curd and the side of the pot. If you see a clean break, the curd is ready to cut. If it is too soft, wait another five minutes and test again. It took a total of 15 minutes in my kitchen. Cut the curds into a checkerboard pattern and put the pot back over medium-high heat. Cook, stirring the curds gently until they reach 110 degrees F. Take the pot off of the heat and continue stirring gently for 3-4 minutes. 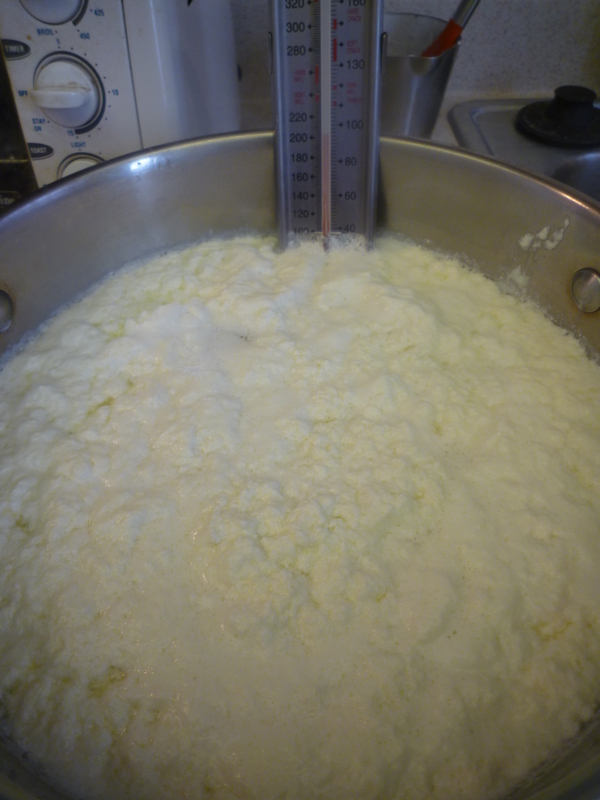 Gently ladle the curds into the colander over a bowl so that you can reserve the whey that drains off of them. Press them gently to remove as much whey as possible and so that they begin to form a cohesive unit. 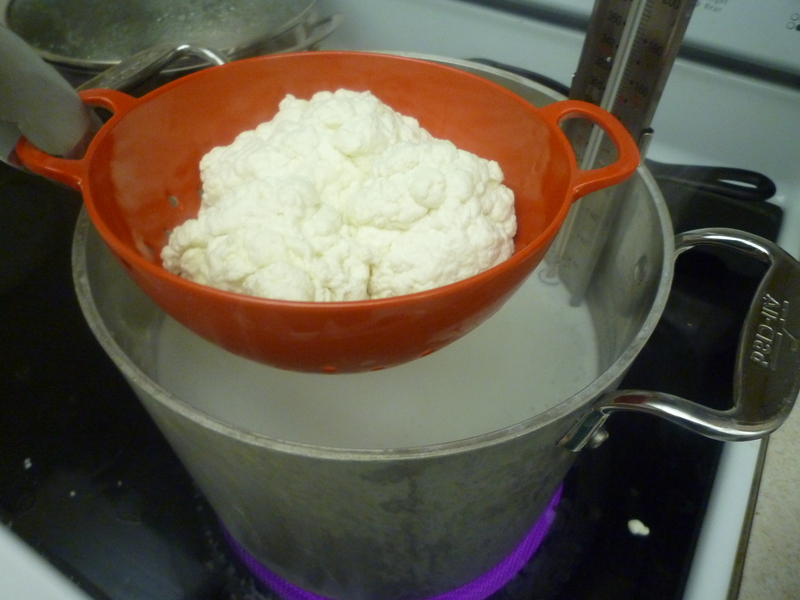 Dip the curds in the colander into the hot whey for several seconds. 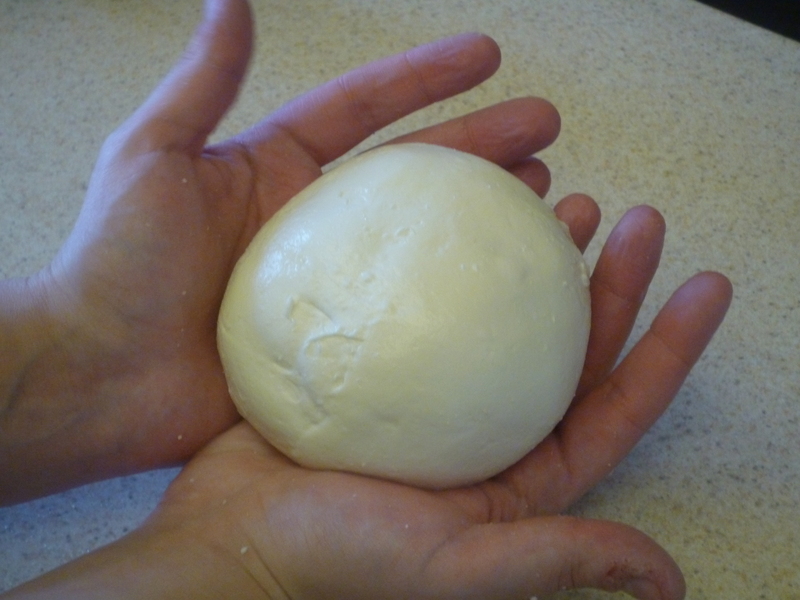 Remove, and then knead the curds like bread dough. Repeat this process several times until the cheese is cohesive and stretchable. The cheese is ready when it is shiny and has a consistency similar to pulled taffy. Roll into a ball and place immediately in a bowl of cold water for ½ hour. This will improve the texture of the cheese. From there you can slice, grate, or melt it however you like. So what did I make for my Valentine? I made a batch of homemade pasta (hail Lidia Bastianich’s recipe) and filled ravioli full of fresh cheese and spices. Topped it all off with a touch of tomato & sweet pepper sauce and sprinkled on a little extra ricotta for good measure. Simple, but with ingredients so lovely I wanted to let them speak. We also had some spinach, artichoke and caramelized onion crostini with hot sopressata, and finished the meal with a decadent little pound cake with vanilla bean whipped cream and blueberry-lime coulis for dessert. Don’t worry, recipes for the apps and dessert are forthcoming! For now, have a happy (and cheesy) Valentine’s day. Share it with the ones you love and remind them just how special they are to you.